Chicken is such a wonderfully versatile animal to cook. 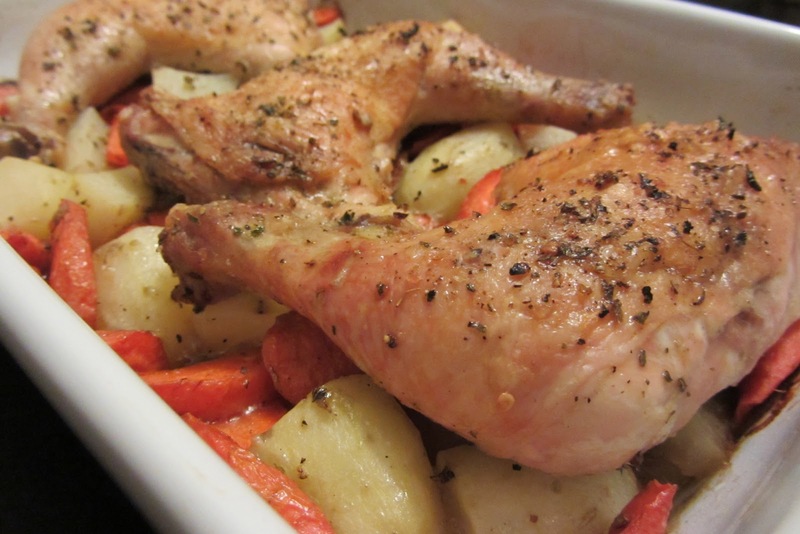 I especially enjoy using the legs and thighs, not only because the dark meat tastes better, but it is also easier to cook. It is not as lean as the breast meat, so it is less prone to dry out if you overcook it by several minutes. I like to season this with plenty of oregano; combined with the potatoes and carrots, it just tastes like good old hearty fall fare. 1. Preheat oven to 400F. Cut the potatoes and carrot into large, 1 inch sized pieces. Place them into a 9×13 inch baking dish. 2. Rinse and pat dry the chicken leg quarters. Season each side with the oregano, salt, and pepper. Place them skin side up onto the vegetables in the baking dish. Drizzle a light coating of olive oil over the chicken. 3. Bake at 400F for 35-40 minutes, until the juices run clear when pierced with a knife. Rotate the baking dish halfway through baking to promote even cooking. * When you rotate the baking dish at the halfway point: if the chicken is browning too much, reduce the oven to 375F for the remaining bake time. I will cook thisThursday—-Looks good. Thanks Eric! Please do let me know how it turns out for you, I always appreciate feedback! Dont You just love food. Nice simple recipe thanks. But don’t wash chicken! It increases the risk of contamination and does nothing good. If the chicken is cooked properly then any nasty bacteria will be killed. Thanks for the comment asdf! Yes, I have recently got into the habit of not pre-washing meats – just patting dry before cooking. It makes sense and eliminates an additional step…win-win! Oh no! Nothing cooked? Was the chicken still raw in the middle? Or were the root vegetables not cooked through? Everything was great! Chicken was cooked all the way thru, I used green beans instead of carrots but it turned out wonderful! Thanks for the kind word Shenise! Glad it turned out so well for you. Keep on cooking! Do you need to cover it? Hi Monica! No need to cover it, the chicken releases alot of juices so that helps keep everything from drying out. You can cover it if you want the carrots and potatos to be softer, or when in a pinch since it cuts down on the cooking time.